Kim is teaching you the very beginning and basics of hand embroidery. 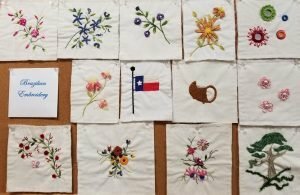 Join us for this class as we will progress from beginning and move through to some more techniques and stitches. Kim has a very extensive background in needlework. She is a quilter, embroiderer (hand and machine) and a crocheter. She has done most of this since a young child. A lot of the things she has learned, she is self taught. Come join her and have fun.